N.B. : The article below is not just helpful for freelance bloggers but to any freelancers who travel a lot. It is written by Rachel Greenberg, a fellow writer from the TheDigest.com. Whether I’m blogging silly photos of my cat in a bunny costume or offering tips on how to be a successful entrepreneur, the beauty of blogging is that I can write from the comfort of my own home. For all of those at-home bloggers that use a residential VoIP system, they get to experience the best of both worlds: they can work in their PJs, but they also have a fully-featured phone system that gives a highly professional outward appearance. With VoIP (Voice over Internet Protocol), customers get a cheap Internet home phone service that is as fully-featured and reliable as any traditional home phone service, but without the high costs associated with traditional providers. In so doing, at-home bloggers can make every penny count without sacrificing quality home phone service. If I’m blogging just for fun, blogging full-time, or blogging for a little supplemental cash, I’m most likely in the market for a money saving telephone system. Installing a telephone line in your home office with a traditional phone provider can result in a huge bill. Traditional phone services often charge installation fees and technician fees on top of you regular high monthly phone bill. And if you want to add a second line, that’ll cost you another pricey visit from the technician. With a residential VoIP provider, however, you receive much cheaper monthly service, while in many cases installation is completely free of charge. VoIP services usually cost $10 to $20 per line, while traditional phone companies are notorious for charging between $20 and $40 per line. VoIP systems can also offer your at-home business a professional outward appearance to the public. With VoIP companies, you can receive numerous free phone features, such as conference calling, call waiting, and call forwarding, which can make your residential blogging business seem more capable and efficient. Oftentimes, traditional phone companies otherwise charge you for these basic features. Well-respected bloggers need to keep up to date on the latest trends, whether it’s a new technology popular among teens or a promising new anti-aging solution, you need to stay on top of the fads. In some cases, you’ll want to receive first-hand information, and that more than likely means picking up the phone to call experts, witnesses, and other bloggers. It’s not uncommon, however, that you will need to interview someone who lives on the other side of the country. The good news is that you don’t have to forgo valuable quotes and opinions from those subjects just because of your fear of long distance calling charges. Countless VoIP providers offer free and unlimited domestic calling on basic residential plans. These basic plans allow you to spend as much time as you want on a nationwide call, jotting down all the juicy details for must-read blog entry. Some of the most successful bloggers have worldwide followers. Acquiring a readership that spans the globe means adapting to an international audience. Bloggers need to write about topics that will interest and intrigue international readers, and to do so, bloggers just may have to pick up the phone. Regardless of whether I’m blogging about current events in China, or announcing a popular hair treatment in the UK, I’ll want to be able to cover every story without worrying about the related phone bills. Fortunately, various residential VoIP providers offer affordable international calling rates. Many providers charge just pennies per minute for international calling, while others provide unlimited international calling plans. These international calling plans offer unlimited calling to various international destinations for a set fee each month. Residential VoIP provider ITP, for example, features a global calling plan with unlimited calling to 60 countries for a flat rate of $24.99/month. Perhaps I’m conducting research at the library for my latest blog entry or maybe I’m just hanging out in the coffee shop while I work. With a VoIP provider, I can continue to send and receive VoIP calls even if I’m miles away from my residential landline. One of the most convenient aspects of VoIP is that with a hosted VoIP system, you can receive your VoIP calls on virtually any mobile device, from PC and laptops to tablets and smartphones. Simply log into your VoIP account on any of these devices, and a softphone will appear on your screen. 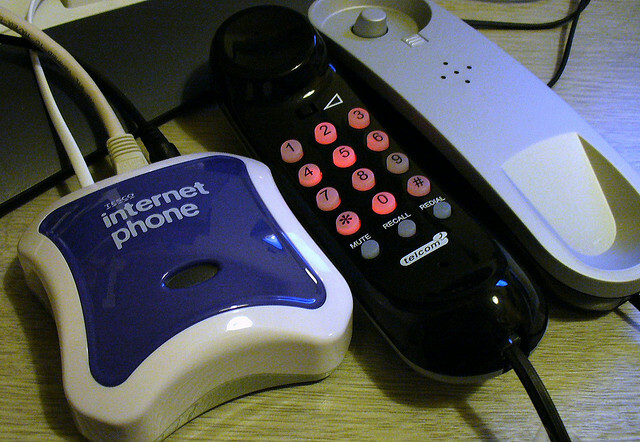 A softphone is an on screen dialpad, which allows you to use your device to make a call through your regular landline phone number. You can also receive incoming calls to your home phone number this way. This is a great feature for bloggers who want the freedom to blog outside of their homes and still remain accessible by their VoIP number. This feature also allows you to take advantage of those unlimited nationwide calls and low calling rates for international calls from any remote location. Rachel Greenberg is a tech and telecom writer and editor.